When I received a preview copy of Joe Yonan's latest cookbook, Eat Your Vegetables, I knew I would have to make his kimchi recipe. And I did. As soon, that is, as my friend Cecilia generously shared with me her stash of Korean red chile flakes. The recipe worked great, and I will share it with you next week. 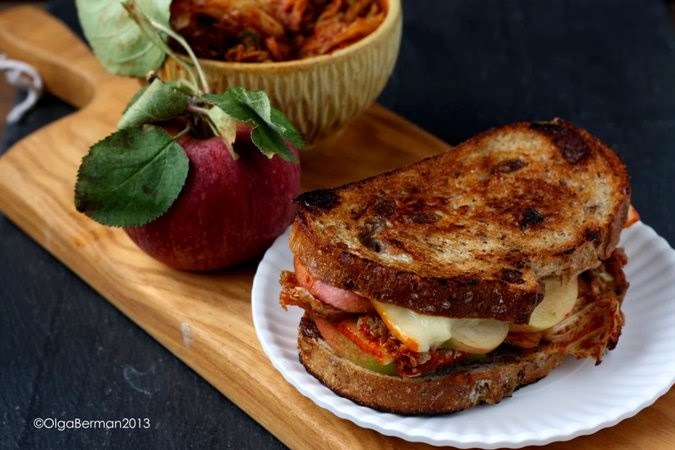 But I could not wait to share with you one of the dishes I made with my homemade kimchi: Grilled Cheese Sandwich with Kimchi and Apples. 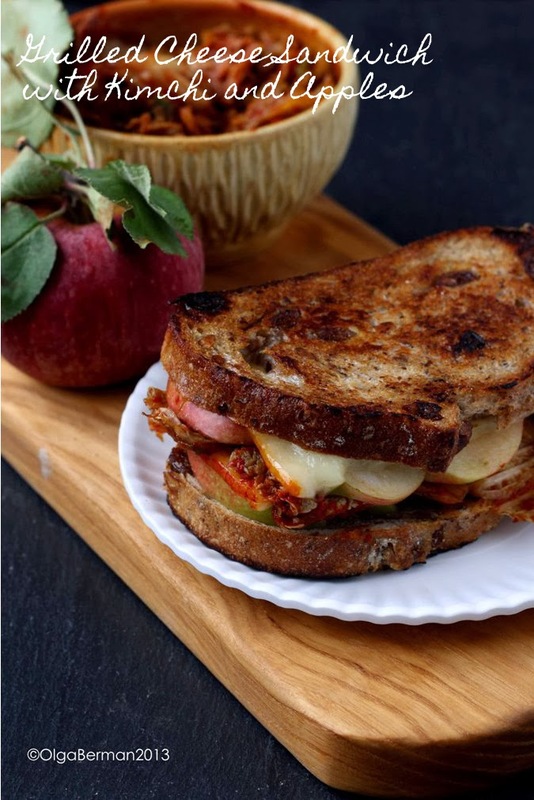 The recipe was inspired by Joe's Grilled Kimcheese recipe, but I changed the type of bread and cheese used and chose to use an apple instead of a pear. 1. 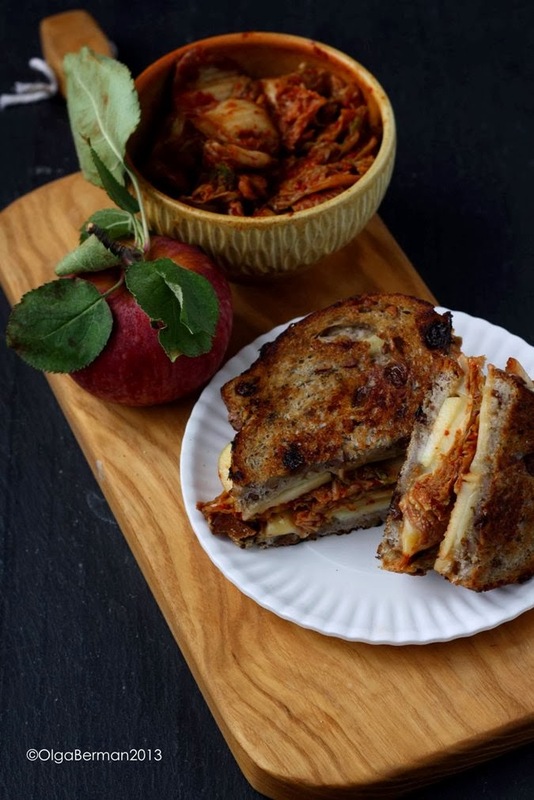 Put together your sandwich: bread, cheese, apple slices, kimchi, cheese, apple slices, bread. 2. Heat the oil in a nonstick skillet. Saute the sandwich on one side for about 4 minutes, then very carefully using a spatula (or two) flip it and saute for 4 more minutes. How gorgeous does that look???? Slice the sandwich diagonally and eat immediately. 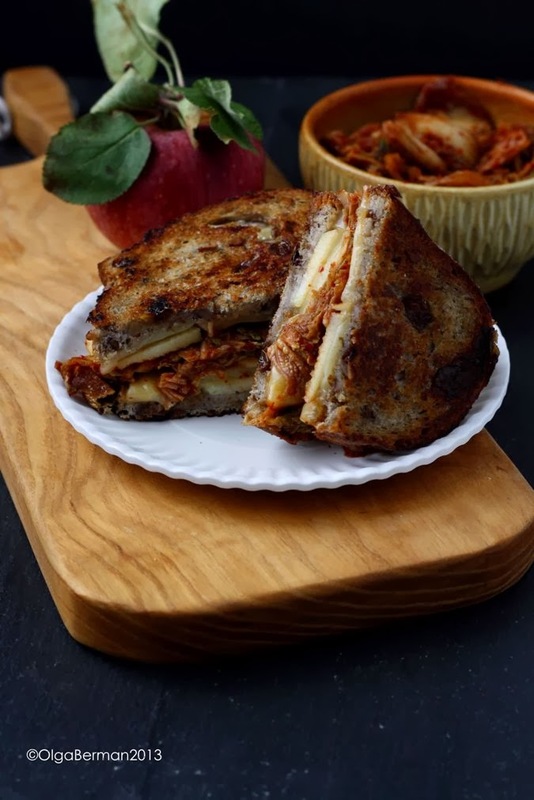 As soon as I ate this grilled cheese with kimchi and apple sandwich, I wanted to make another one..but I resisted. 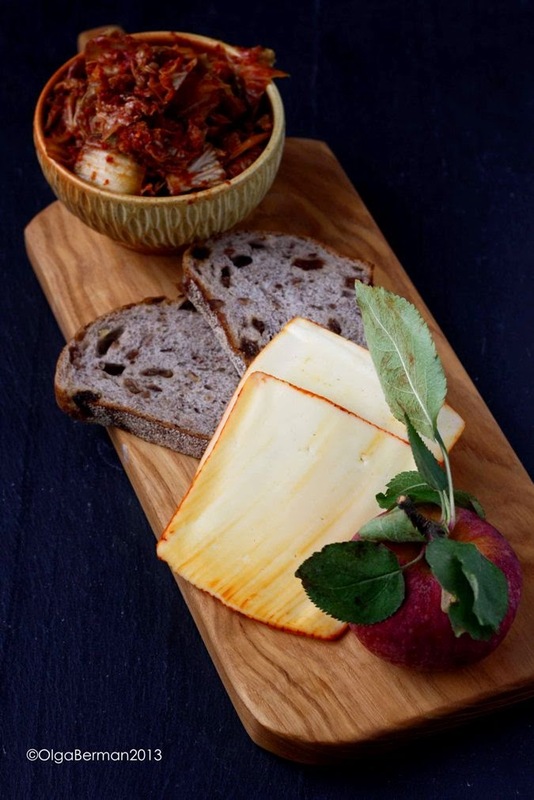 I loved how the sweetness of the apples and the raisins in the bread contrasted with the spicy kimchy and mild Muenster. I think the kimchi really shined in my creation. Would you give this sandwich a try? Please do!! 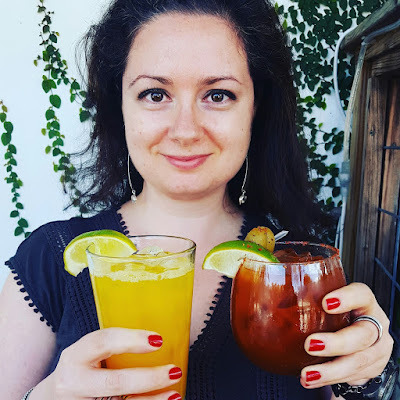 For other things to make with kimchi, check out my recipes for Oatmeal with Kimchi & Fried Egg, Kimchi Soup, and Kimchi Fried Rice. I've also made a Kimchi & Tuna Melt for my Monday night dinner by combining tuna with a bit of mayonnaise and chopped onion and adding it to two slices of bread. I then topped the tuna with kimchi and Muenster cheese and broiled the two open-faced sandwiches for 5 minutes: incredible! Make sure to come back next week to check out Joe's recipe for kimchi and a bit more information about his cookbook. What's your favorite way to cook with kimchi? 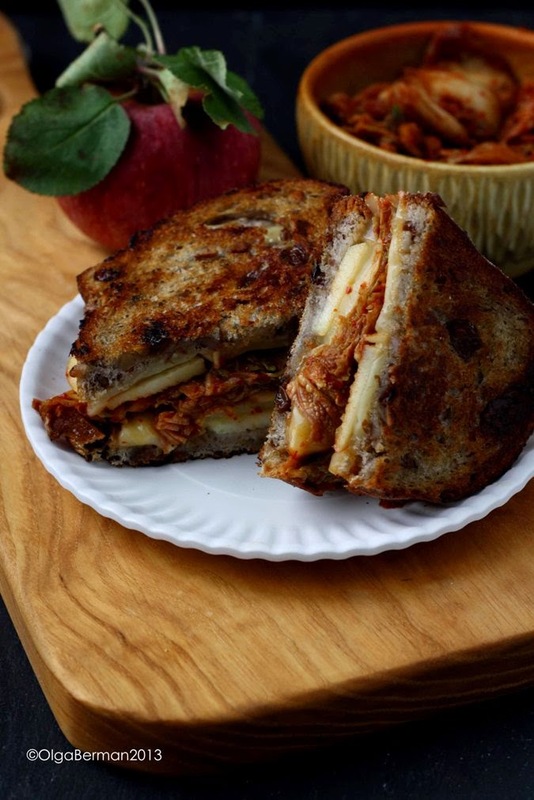 What's your favorite "unusual" addition to a grilled cheese sandwich? That is one gorgeous sandwich! Sounds like it has some great sweet and tangy flavors going on too! 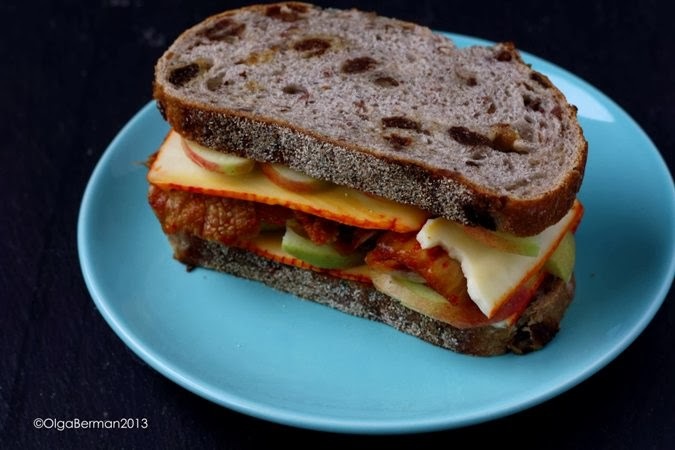 I am obsessed with kimchi, so I know that I would be IN LOVE with this beautiful sandwich. Just finished a huge meal but I'm already hungry after looking at this!